Some Singapore-listed companies have faced declining returns on assets and invested capital since 2010, with returns reaching their lowest level in over a decade last year, a new report has found. This raises the question of whether these companies may be destroying value rather than creating it, said a report by CLSA, a brokerage and investment company. "The compression of returns on invested capital has now reached a stage where Singapore companies are generating returns below their weighted-average cost of capital, which implies they have been destroying value," Mr Jonathan Galligan, head of Singapore research at CLSA, told The Straits Times earlier this month. He based his analysis on 47 Singapore Exchange-listed companies that CLSA covers, including blue chips like banks and telcos. "Singapore blue chips' lack of growth highlights just how vulnerable the city can be," wrote Mr Galligan in a report last month. Traditional businesses here are struggling to eke out profits whereas "new economy" sectors such as fintech, e-commerce, data technologies and the sharing economy are fast capturing the market's attention. For example, the sharing economy is changing consumption habits in a profound way. Sharing a good or asset increases its use and lowers the demand for new items. The problem with the incumbents, Mr Galligan feels, is a failure of vision. "What a lot of management teams and boards have failed to understand is how disruption will continue to evolve," he said. "They're looking at what Uber is doing right now that is disrupting their business, and then they're planning around that. But what they're not thinking about is what Uber will do in six months, or 12 months." Another problem is that firms here have been more focused on finding ways to keep costs down, as opposed to investing in the revenue line, to drive businesses forward. The lacklustre growth climate is partly to blame, and it is a bit of a chicken-and-egg situation, Mr Galligan explained. "Management teams don't want to invest in the topline because they don't see any economic growth, but there's no economic growth because nobody wants to invest in their topline." The result? 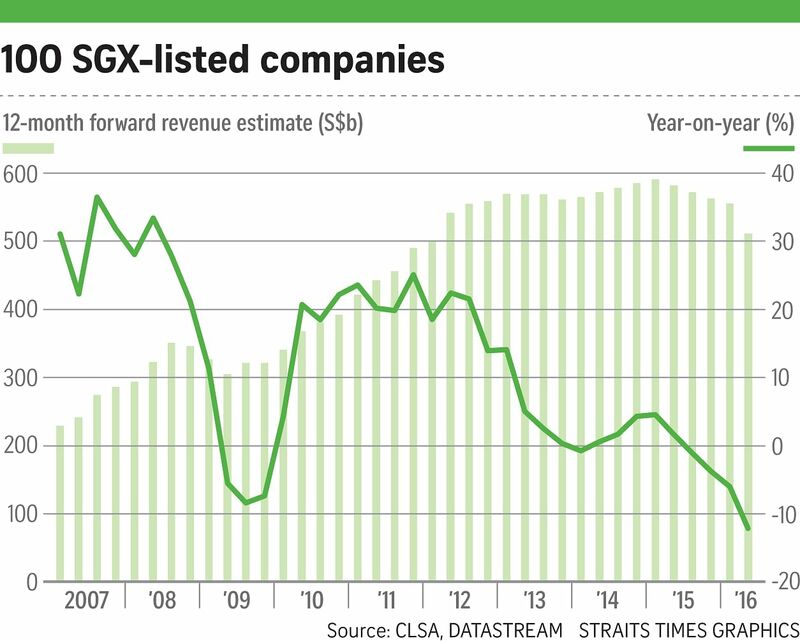 Revenue growth at Singapore's top 100 listed companies is on a downtrend. So, is Singapore Inc really destroying value? SGX, in answer to this question, pointed out that SGX-listed companies paid about $10 billion in dividends in the first half of the year. And many companies, from airport services provider Sats to electronics retailer Challenger have been investing in transformation. Mr Galligan maintained that he is optimistic on the Singapore economy in the long term. But he still worries that "very few management teams and boards have recognised the real threat of disruption".